Tonight at our needlework gathering at Borders we prepared our Special Olympics scarves to be mailed out. We each wrote a handwritten note, and packaged it with our scarf in a plastic bag. We had 13 completed scarves, and 2 more in progress. We will have either 14 or 15 to ship. Tomorrow I need to get a packing box and get them ready to go out. I'm very excited that we had this opportunity to crochet for the Special Olympic athletes. Are you a Fearless Crocheter? I subscribe to the Knitting Daily newsletter, not because I'm such a knitting fiend, but because it's packed with information that I can use as a crocheter. Every day a KD newsletters arrives in my email inbox. Sometimes it's an advertisement for a new knitting book or magazine, but usually it's about the techniques of knitting. How is this helpful to me as a crocheter? The easiest thing to notice is that looking at pictures of knitted sweaters, baby items, etc. gives me ideas of body shape, sleeve length, interesting edgings, buttons, etc. I print a lot of these out and make notes of how I could modify it for a crocheted garment. This is also a great way to start sorting out colors and color combinations that I might like to try in a crocheted item. Next I like the galleries: a sweater for the magazine is brought in and everyone in the office tries it on and has her picture taken wearing it. Then all the pictures are put together in one newsletter with information about the sweater size. The models sizes are noted, with information about positive or negative ease, and then plenty of comments about how the style/size look on this person, and how that size could be modified to better fit and flatter the model. That's a lot of valuable information before you even start with a gauge swatch or a beginning chain! Next are the detailed technique articles; such as positive and negative ease, fitting, short row bust darts, buttonholes, selecting buttons, color,... all of the information can easily be translated to our crochet work. I love the way knitted sweaters are designed to fit the human body, while so many crochet patterns are designed as rectangular pieces sewn together at shoulder and side seams. Crocheters know how to make short rows, even if they don't know that's the name for the shaping. Remember the top I made this summer in NaturallyCaron Spa? The design was based on square motifs joined into panels, edged and then the panels were joined. The picture in the magazine was beautiful with a center panel down the center front of the top. When I got to the final construction of the garment, I found that the larger size that I needed had two panels down the center front and two down the center back. I was not at all happy with the look, and knew that I wouldn't wear it like that. Even though I had only 6 or 7 rows of edging to complete the top, I insisted on unstitching several seams, reworking two panels, and inserting the modified panels between the front and back panels to create a side/underarm panel. This put the beautiful center panel straight down the front. I really love the final garment. I used information from KD articles to jump right in and modify a pattern so that it fit me. I am a big fan of Knitting Daily and it's positive influence on my crocheting. I proudly display the KD Fearless Crocheter button! We had a gift exchange with our needlework group at Borders on Tuesday. There were 16 of us participating. There was a nice variety of ornaments including crocheted, felt & embroidered, chain mail and store bought. We all had to "oooh and aaah" over all the items and talked about how they were made. I got John's chain mail "Persian dragon scale" made into a Christmas ornament (that wasn't luck, when it was my turn to pick from the gifts, I asked "which one is John's?). I can now tell you about the trip to the new JoAnn Fabrics and making the ornaments. I bought a bag of 2 inch Styrofoam balls, a bottle of brush on craft glue, and 3 small, plastic crochet hooks. I started by brushing glue on a small portion of the ball, and then winding yarn around as if I was winding a ball of yarn. I selected the Red Heart Holly & Ivy variegated left from the round afghan. When the ball was almost covered with yarn, I put a small amount of glue on the middle of a crochet hook, and then shoved it through the Styrofoam. With another hook I took the end of the yarn and made a chain long enough to serve as a hanger, slip stitched to the beginning of the chain, and then made a few more chains, then I put one of the chains onto the hook in the ball. Quick, easy, cheap, but so "Crochet". I actually made one for the exchange and one for myself, plus one extra. I had finished most of my shopping and wrapping (not all, because daughter #2 is not coming home until Jan. 2nd, so we are leaving packages under the tree till then), so I started on a new doily. The fingers have been itching for a new one! It's a Patricia Kristofferson design from Absolutely Gorgeous Doilies. I took it along to work on at MIL's in the evenings. I've now finished about 24 of the 29 rounds; and thinking of what colors I might use to make it again with the overlay stitches in a different color from the background. I also started another scarf for the Special Olympics project. I had one in Tunisian, and one in double-hook, and hadn't made any progress. I wasn't thrilled with the designs, but wasn't sure that if I started something new that I'd like it any better. But, I grabbed the 365 Crochet Stitches a Year and found one that I liked. It's Feb 7th, and called Winding Roads. I worked lengthwise, made 2 rows of blue, 2 rows of white and then 2 rows of blue. I finished it in about 24 hours, and I'm happy with it. I frogged the other two, but still think that I might make one more. We're packing them up on Tuesday night at Borders. We spent Christmas day at a cousin's house. She's a collector, and her husband is into historical stuff, the house was filled with fun things to look at. I was fascinated by all the crocheted items of course. She had some crochet made by her (and my husband's grandmother), some items picked up at antique stores, and a doily that I had made from a pattern that I found in a book at the "Antique Pattern Library". I had forgotten that I had made a doily for her, but I recognized the pattern immediately. She also had several doilies that were made in two colors, white and a pale ecru. I've never seen any with these two color combinations, but it was quite nice. Hope everyone enjoyed all the holidays that this month contained, and wishes for a Happy New Year! First, the Pennsylvania Farm Show, January 10th - 17th. Here we will display some of our service projects, and give demonstrations of crochet. We need to prepare some "starts" in case people want to learn some basic stitches, and handouts about the CGOA and our chapter. We'll be at the Keystone Lace Guild booth, if you want to stop and chat. The Gathering of the Guilds will be Feb. 28th. For this we'll need more handouts, crochet projects to display, and posters. We can also plan to do one hour workshops as a Make It/Take it. This will be something that demonstrates a little bit about crochet, while allowing people to do very basic crochet & still finish a project in a short time. No definite ideas on this yet. We need to have some crocheted items to give as door prizes, but we should have a supply of bookmarkers left from last year. After months of preparation, we were snowed out last year. I am excited to be thinking about preparing for another Gathering. It was this event which got me interested in starting a local crochet guild! Last Monday's weather report called for snow starting about dawn, and accumulating. I "kinda" hoped for a snow day. But no snow when I got up, so went to school. We did get out early, no 6th period. But I don't teach 6th period anyway,... It did start snowing after lunch. I decided not to go out to Borders, only a few people did show up, those who lived very local. Our ornament exchange was postponed, so it will be tonight. So I can't give any "how to" on the ornaments, yet. I've been working on a lot of little things. I finally blocked the filet runner,... I need to take it along when we go to MIL's for Christmas eve. From there we're going to a cousin's house for a family dinner. I'm thinking of sorting through some doilies to see what I have to give to the cousin. I gifted two doilies to the boss & her mom at the studio pary Saturday. We had snow, sleet, freezing rain, was that Saturday?, which coated the trees. The snowy-mix they predicted yesterday didn't arrive, but it is extremely cold. Luckily we're not getting hit with the snow that the true North-East is getting. But it's still very Christmasy! In today's emails I got a newsletter from Royal Yarns. I checked out their Tunisian hooks,...They had Addi turbo afghan hooks in sizes A through G. What kind of yarn would you put on a size A Tunisian hook? I started this a few days ago, and saved it as a draft, thinking that I might add something to it...but really what else is there to say? How are things progressing? I've gotten two doilies and a snowflake filet blocked and off the board. I now need to block the runner that I finally finished and get it ready to take to hubby's aunt when we go down for family get-together for Christmas. 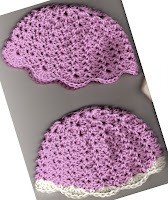 I've finished 2 baby hats for Knit One, Save One using Dee's Tulip hat pattern. It's absolutely adorable, and I used Cotsoy, a blend of cotton and soy, that's unbelievably soft. I also made a little hat using Tunisian shells and columns pattern and Bernat Baby Jacquards. 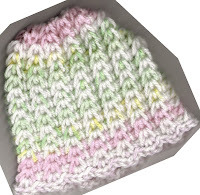 It's a soft green, pink, yellow and white that looks very springy, like Easter grass! or pastel jelly beans! This week I also finished up the afghan for the dance studio. I used the Skipping Stones at Patricia Hewlett's site, and used mill ends of hunter green and cranberry, RH soft white and a Victorian Christmas variegated called Holly & Ivy. Yesterday I did some shopping at Joann Fabric for craft supplies. Then I made some Christmas ornaments. One will be for the Tuesday Crochet in Public group that meets at Borders, and one will probably go to Yarn-Love (LYS) for their Christmas garland. I dropped off 3 ornaments last week. I might write the info on how to make the ornaments next week. But until Tuesday evening, it's a secret! I'm still around, and all is well. It's just that this school year seems more "packed" with activities than others. I have 3 part-time jobs all related to education, and on the "school year schedule". Having homeschooled our 2 girls, this artificial schedule can be constricting! Along with that, our local CGOA Guild is very busy at this time of year, we're finishing up hats to mail to Save the Children's Knit One/Save One campaign, and finishing up scarves for the Special Olympics project, we're having an ornament exchange in our Tuesday evening Hooks and Needles (Crochet in Public) group, I'm scheduling meetings for the coming year, and we're starting to work on the 2009 Gathering of the Guilds. Ah, I'm also finishing up the latest afghan to be donated to the dance studio to be raffled as a fund-raiser. I have several posts started and waiting in the draft stage. Maybe I'll catch up with them soon.